R657-5-15. Party Hunting and Use of Dogs. (2) A person may not use the aid of a dog to take, chase, harm or harass big game. 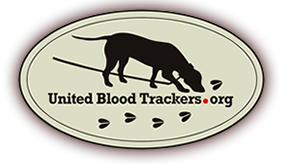 The use of one blood-trailing dog controlled by leash during lawful hunting hours within 72 hours of shooting a big game animal is allowed to track wounded animals and aid in recovery.